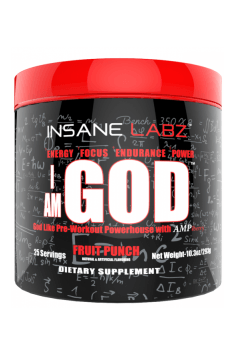 Insane Labz I am GOD is an advanced pre-workout supplement, also considered a fat burner. It maximizes effort abilities, strongly stimulates and promotes weight loss. Creatine monohydrate – the best-researched form of creatine, a compound with important properties promoting physical efficiency and anabolism. It is a substrate in the reaction of energy extraction from phosphagens, characteristic to short-lasting efforts. This system dominates during sprint or strength trainings. Increased creatine supply considerably promotes efficiency, allowing to increase training intensity. This, in turn, enables faster progress and provides the organism with considerable training stimuli. However, the role of creatine is not only limited to providing an energy substrate. It is also able to increase the amount of liquid inside cells creating muscle tissue, called sarcoplasm. It allows to optimize the environment inside myocytes, which is related to the promotion of physiological processes that take place there, including regeneration and tissue growth. When it comes to muscle anabolism, creatine is also effective thanks to its ability to modify the activity of myostatins. They are the factors limiting muscle tissue growth. Creatine limits their activity, promoting anabolic processes in the organism. Beta-Alanine – an amino acid, which demonstrates considerable effectiveness on the field of optimizing acid-base environment. It is a carnosine precursor, a compound which plays a role of a pH buffer. Thanks to this, it is able to neutralize the activity of lactic acid, secreted in the tissue of skeletal muscles during physical effort. In this way, supplementation with beta-alanine limits soreness in muscles, delays fatigue and allows to perform longer training sessions and maintain at the same time maximal physical abilities. Optimization of acid-base environment is also conducive to effective regeneration. Taurine – has strong synergistic effect with creatine, also present in the preparation, for which it is a transporter. Thanks to this, it increases the efficiency of the phosphagen system of energy extraction even more. Apart from this, it also demonstrates autonomous positive influence on the organism. It is considered a neurotransmitter, it is an agonist of gamma-aminobutyric acid receptors. It increases cognitive abilities. It also influences the cardiovascular system – it is able to increase the strength of contraction of the heart muscle. Tyrosine – an amino acid which is a precursor for many compounds, important for the functioning of the organism and demonstrating biological activity. Being present on the pathway of the synthesis of catecholamines, tyrosine plays a key role in regulating their synthesis. Proper supply of this amino acid is conducive to the production of adrenaline and noradrenaline, stimulating the functions of the organism. It allows to increase training intensity. Tyrosine is also a precursor of dopamine, an active neurotransmitter both towards motor and psychological functions. In the extrapyramidal system, it is responsible for maintaining proper neuromotor control. In the limbic system, in turn, dopamine is related to the creation of positive emotions as well as motivation, which is important from the point of view of training. Moreover, thyroxine and triiodothyronine are synthesized from tyrosine in the thyroid, which are responsible for metabolism stimulation. Therefore, proper supply of this amino acid is related to increased metabolic rate. Caffeine – is contained in the preparation in two forms: anhydrous and citrate. It is a strong supplement, popular for its effectiveness and relative safety of use, increasing effort abilities and reducing the feeling of fatigue. It is active in the organism as a competitive inhibitor of cAMP-phosphodiesterase, an enzyme transforming cyclic adenosine monophosphate to its biologically inactive form. Thanks to this, it increases the amount of cAMP in a cell, promoting the stimulation of adrenaline activity in the organism. Moreover, caffeine is also a competitive inhibitor of adenosine. It binds with its receptors, limiting adenosine’s ability to activate them. In this way, it inhibits the information about fatigue, carried by adenosine molecules. Betaine anhydrous – also called N,N,N-trimethylglycine, is a donor for methyl groups in the process of homocysteine conversion to methionine. Thanks to this, it positively influences methylation efficiency, which is essential for efficient energy balance of the organism. Thanks to its presence in this reaction, it also has cardioprotective effect. Moreover, betaine, similarly to creatine, increases hydration of cells, promoting their metabolism by optimization of water-electrolyte balance. Dimethylethanolamine – a compound, which is a precursor of the main stimulating neurotransmitter in the human organism, acetylcholine. Increasing the supply of DMAE is conducive to the synthesis of ACh, promoting its functionality in the organism. It promotes nerve transmission, demonstrating stimulating properties. Supplementation with dimethylethanolamine is especially effective on the field of the promotion of cognitive functions. It also positively influences reaction time (which is shorter) and facilitates concentration. AMPiberry® - legally protected form of extract from common juniper. It demonstrates considerable antioxidant potential, may increase the level of the main antioxidant mechanism in the organism, superoxide dismutase. It has antioxidant and analgesic properties. Apart from this, the producer declares that AMPiberry contains an analogue of AMP citrate in its composition, demonstrating important stimulating properties and increasing effort abilities. Rauwolfia Vomitoria extract – standardized for the minimal content of 90% alpha-yohimbine, an alkaloid, commonly used in order to promote the pace of fat burning. It owes its effectiveness in the system to the ability to stimulate alpha-2-adrenergic receptors. It demonstrates important stimulating properties and increases work efficiency of the cardiovascular system. Apart from this, it considerably increases lipolysis, especially in the so-called “stubborn areas”, i.e. in the area of the belly, thighs and hips. Vitamin C – a strong antioxidant, allows to effectively fight with oxidative stress. One of many factors stimulating the creation of free radicals is intensive physical effort, therefore additional protection during workout is recommended. An additive of vitamin C enables prophylaxis against oxidative stress consequences and is conducive to regeneration processes. Sodium and potassium – two main electrolytes, regulating water balance of the organism. Their loss with sweat during training negatively influences water environment in the organism, therefore it is important to take care about their supplementation. Proper supply of sodium and potassium promotes the possibilities of the organism, thanks to the optimization of the environment for biochemical changes taking place in all cells of the organism. To sum up, Insane Labz I am GOD is an advanced pre-workout supplement, which multidimensionally supports effort abilities. It facilitates going through the toughest assumptions, thanks to stimulating properties and motivation support as well as thanks to increasing work efficiency of the organism and physical efficiency. Moreover, it promotes lipolysis, which is appreciated by all people during fat reduction. Take 1 portion (1 scoop) about 30 mins. before training. Due to the content of yohimbine, the preparation should be used away from meals containing proteins and/or carbohydrates. The supplement cannot be used by people who have any problems with the functioning of the cardiovascular system. The preparation cannot be combined with other stimulating substances due to the high content of stimulants. In order to intensify the effect stimulating physical efficiency and “muscle pump”, it may be considered to add the supplementation with nitric oxide boosters, such as citrulline or arginine.